Sewing is an extremely fun and highly practical hobby. But, it’s important to develop your new skills in a logical, step by step manner so that you you are constantly creating gorgeous pieces and not getting discouraged. Rather than overwhelm yourself with overambitious projects, get started with some simple basics that will help you develop your skills in a slow and steady way before moving onto more challenging aspects. Sewing by hand is a great way to get experience, and it might even be what got you interested in the hobby in the first place. But if you want to get serious about sewing and make the most out of it, you’ll have to invest in a sewing machine. It doesn’t have to be the best quality or the priciest brand, just something that will get the job done. When you first sit down at your sewing machine keep the manual by your side. Using some scrap fabric, familiarize yourself with the machine’s capabilities. Get comfortable with threading the bobbin and needle. Go forward and backward. Adjust the needle position and the distance between stitches and experiment with zig-zag widths. Test out how the machine deals with thick fabric, stretchy fabric and average fabric. And, if it has a buttonhole setting, try experimenting with that as well. Get really comfortable with what your machine can do so you’ll have fewer mistakes to worry about moving forward. As with any new skill, you have to start with the basics before you get into the really fun stuff. Just as you wouldn’t spend your first day driving on a 400-series highway, you shouldn’t try to get into the swing of sewing by making a lace ballgown. 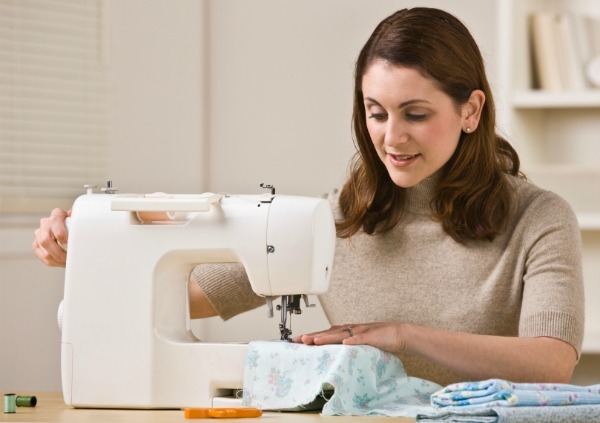 Martha Stewart offers some great beginners’ sewing projects. Her crafts are superb because many of them are either accessories or home decor, so they can easily be done with small amounts of inexpensive fabric. This means that if things don’t go quite the way you planned, it isn’t the end of the world. Once you feel comfortable creating small items such as scarves, clutches and totes, you can consider getting into clothes-making. McCall’s, Butterick, Vogue and Simplicity all offer collections of easier sewing patterns so you can learn the basics and create stylish new items at the same time. Some sewing techniques, such as boning, gathering and putting in zippers, can take months or years before you feel totally confident in your abilities. This doesn’t mean you should avoid them all together; it simply means that you should be patient with yourself as you work on developing such skills. For instance, the first time you work on gathering, do it for a pyjama top or gym bag, so that if it doesn’t turn out perfectly it isn’t the end of the world. If you feel you are advanced enough to begin working on some of these techniques, aim to perfect them one at a time. Rather than jumping into it with a tight, ruched strapless dress with a zipper, start off with a simple gathered blouse and then maybe a gathered blouse that requires boning, and so on. Just remember, no skill was perfected in a day. So take things step by step and you’ll be well on your way to feeling like a confident seamstress in no time!